I love being part of a professional organization that encourages new authors and supports multi-published ones. The leaders of the Houston Writers Guild volunteer to organize events for over 200 members. Even if you don’t live anywhere near Houston, I would highly recommend you join this active organization! I have already signed up for the April Conference. In 2015, I learned details about the craft of writing as well as how to sell my book. Query letters and submissions and agents, oh my! I will take any hints I can get!!! You can sign up to attend even if you are not a member. Last year, I was introduced to professionals in the field. Due to the connections and friends I made, I have a lead on getting Tarbin’s True Heir published. If I did not feel obligated to wait for Baen, I would already be moving forward on that. Check out Inklings Publishing if you’re looking for a hardworking, traditional small press. They have an open submissions policy, no agent required. The details are here. Last Friday I attended the HWG Meet Up in downtown Houston. We had over twenty writers show up and share their journeys. It’s a b last to eat and shake hands and sh are stories. It’ s motivating to watch people succeed and know you could be next. It’s time-saving to hear other people’s mistakes and vow not to repeat them. I have books to beta read and volunteers to do the same for my next manuscript. I am still in contact with the community I met through Jody Lynn Nye’s Writer’s Workshop at Dragon Con. We started an alumni group for any past member who want to join instead of participants from only one year. This group has stayed active on Facebook rooting our successes, asking for advice and sharing writing opportunities. I suppose what I am saying is FIND YOUR NETWORK. Quite frankly, this is good advice for everyone, not only writers. My Girl Scout Community works together to make the world a better place. The Klein Oak Band Community works together to make the program as successful as it can be, as well as sharing information for those of us whose child might not be as organized at bringing home memos as others. Cough, Xander, cough. SCC Farm works together to keep our children safe as well as competitive as they make their way through equestrian adventures. Of course, a network has numerous benefits for your family and your career. PLEASE don’t forget to give back. I am beta reading for fellow writers. I volunteer with the organizations my children are involved in. These mini-communities we participate in only work if it is TWO sided. Okay, enough lecturing. Maybe I get a bit frustrated sometimes when we can’t get enough volunteers. 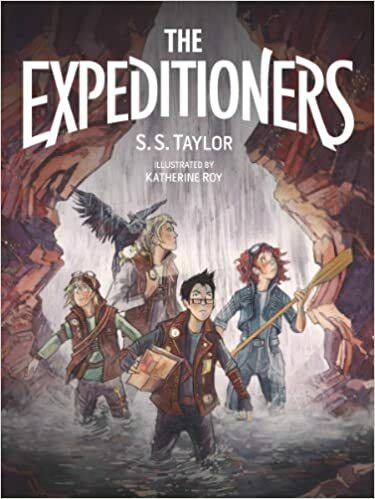 My current read: The Expeditioners by S.S.Taylor. I’m not sure how this book is officially categorized, but I would call it middle grade steampunk. Orphaned siblings are tasked with solving a mystery left by their father. All three are capable and solve problems differently. The story line is simple. If that bothers you, don’t read it. I mean, it’s written for children after all. I enjoy the characters and setting enough that I look forward to the sequel. As a writer, I’ve begun looking at the novels I’m reading uniquely. The gadgets are fun, but only used as solutions to the plot. I would like to see some gadgets that defined the world without having a job in the story. Taylor repeatedly uses the word “said” throughout the novel. Though not technically incorrect, I did find it grossly distracting. I am not sure I would have noticed such a thing before I started looking at my own work critically. Previous story Book Reviews: Can you trust them?